“The Passage meets Ender’s Game in an epic new series from award-winning author Rick Yancey. The 5th Wave by Rick Yancey is one of those books that, once you start reading, it's hard to put back down. After the 4th Wave it's hard to know who's human and who isn't. It's hard to trust when you don't know how to tell who the enemy is. And Yancey not only instills that idea, not only in his characters minds, but in his readers as well. Should you trust the characters you think you know or are they manipulating you? Or worse, are they being manipulated? Cassie is a feisty heroine, I'll give her that. She's tough and does what she needs to do, but when it comes to boys... well, they're her kryptonite. Boys, namely Evan Walker, seem to turn Cassie into an unreasonable, melodramatic teenager, even though I know she's smarter than that. She knows she's smarter than that. And I like Evan, I really do, but their relationship was such instalove that I just couldn't get into it. They were sweet and I like them together, I just wish Cassie would have stayed strong to her beliefs when getting involved with him. And that Yancey would have flushed out their relationship better. It happened over the course of weeks (months, maybe) but the way it was written (at first at least) left me wanting, even if the idea of their relationship was great. Ben on the other hand... Oh, Ben Parish. I fell in love with him. Hard. He's been through a lot and he's broken, but not weak. He's loving and perfect and takes care of his squad no matter what, even when he's scared. He makes hard decisions and sometimes they don't end the way he wants them to, but he pushes through anyway. I really loved the relationship he had with Nugget. And, although I'm still a little unsure about Ringer, I thought their relationship was cute too. The 5th Wave, despite having almost nothing but glowing reviews, still managed to shock me. It was one of the best books I've read this year. Definitely the best alien invasion I've read about since The Host. If you have any doubts regarding the hype behind The 5th Wave, try not to think about it. Just pick up the book and lose yourself in the adventure. 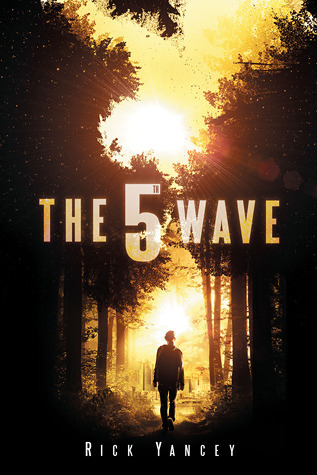 For more about The 5th Wave check out these sites! I admit the hype has me nervous about finally cracking it open, but I love that you were still surprised by it. I know I'm missing out by waiting. Great review. I LOVED this book. It was crazy intense on the alien stuff. Ben is an awesome character. I am really looking forward to seeing where Rick takes this series.It is quite frightening to think that it doesn't take much for another life form to take us by surprise and cull us down to a manageable handful. Gah! !